I was recently given the opportunity to produce a short film for work about a new website, coming soon for internal workers. Since I hadn’t really made a short film since my student efforts with Stephen Fry in 1995 – when we were outputting to VHS! – I thought it’d be a great chance to learn what had changed in the last 15 years. A lot. Of course, I was the one asking the questions, although it took me a while to master my brief, as they are wont to say in the civil service. But by the time I’d recorded and logged all the interviews, I had enough soundbites to put something together, although it then became a bit of a mad dash to try and find alternative footage to pep up the visuals – and amazingly, if you want to film at the place you work, you need a permit. Plus there’s so much footage in the archives that it’s actually very difficult to try and find the footage you want, that somebody else MUST have surely filmed. All in all, we spent a day and a half filming, and got about 90 minutes of raw footage out of eight quick interviews, most of them lasting less than ten minutes. It took me a couple of hours to transcribe the interviews to create a rough “script” to take to the edit suite. Having spent most of my working life vainly trying to get work computers to do basic video editing, it was a real blessing to walk into a properly maintained edit suite running Final Cut Pro, being run by an editor who knew what he was doing. Even if it didn’t seem that different from Adobe Premiere Pro. We even managed to add in a couple of graphical flourishes and a visual gag. I did miss the physicality of doing it myself though – of pressing the buttons, using the jog wheel etc. Now I’ve got a vague hunger to see what else I can film and edit. Of course, that would mean finding a subject, the time, the motivation – oh, and the equipment as well. I’ve often thought that if you’re going to go to the bother of remaking a film or a song, you should at least do it a bit differently. Like the Pet Shop Boys doing Always On My Mind, or … the Pet Shop Boys doing Where The Streets Have No Name. Anyway, we now have the new trailer for The Karate Kid, starring Jackie Chan and Will Smith’s son Jaden Smith. Then real life intervened, London prices arrived, and I just … stopped. Of course, seeing the terrible films Batman and Robin, and Jurassic Park II within a week of each other didn’t help at all. Neither, ironically, did becoming a professional film reviewer where film-watching no longer became a leisurely activity, but something that was work and that I’d have to write up afterwards. Sure, there were the glam moments (well, if you count having a bored Julianne Moore scowling at you at 10am because she thinks you’re a Japanese film journalist) but also having to review dross like Help I’m A Fish and Mission: Impossible 2 didn’t help. So, while I didn’t turn my back entirely on cinema – The Matrix made me revise my entire thoughts on Hong Kong cinema – I’m not the raving film geek I used to be. At least not till tonight. 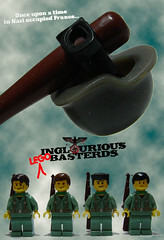 Tonight, I went to see Quentin Tarantino’s latest, Inglourious Basterds. And bugger me, I loved it. Even if it didn’t have any of the crash, bang, wallop that you’d expect. Instead, it’s a love letter to dialogue in multiple languages, to European cinema, to war-torn Europe, and for 147 minutes I was utterly captivated by the words, the acting, everything. Even the set. As you may know, I’m a bit of a film fan. I also have a slightly obsessive interest in apocalyptic fiction and Hollywood blockbusters. So why on earth am I most likely to avoid 28 Weeks Later and Spiderman 3? Simply put, they both scare me in totally different ways. Spiderman 1 was a great film, fantastic on pretty much every level. Almost too fantastic. I was a bit of an emotional wreck at the last scene – how could Peter Parker do that to his gorgeous simpering Mary Jane? How could any red-costumed or red-blooded heterosexual walk away from that? Because of that, I’ve somehow managed to avoid Spiderman 2 – despite having it on DVD – and will most likely manage to “never get round to seeing” Spiderman 3. As for 28 Weeks Later, it’s because of my fear for zombies. I’m not sure what it is about them, but I do get terrified at the prospect of seeing zombies on the screen. When Shaun of the Dead slithered into cinemas, I really wanted to see it – hey, it’s Spaced + apocalyptic fiction + London, what’s there not to like? – and so resolved to get over my fear of zombies. After all, they’re just a movie construct and fantasy, right? Almost. My zombie-fear-aversion routine was to watch as many zombie films as I could, in growing order of horror-ness until I thought I was desensitized to zombies, and then perhaps I could manage Shaun of the Dead. So the first film I tried was Resident Evil: Apocalypse. It’s a 15-rated film, starring Milla Jovovich and it seems like a B-movie. What could be that scary about it? Who knows? Because when it came to the scene with the shuffling zombies chasing one poor civillian up a metal staircase, I had to switch off the DVD. I just couldn’t handle it. I did somehow manage to see 28 Days Later – there aren’t that many zombie scenes in it, after all. 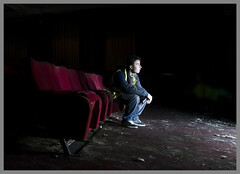 But I did walk out of the cinema absolutely shaken, in need of a stiff drink and some human conversation. So I knocked on my then room-mate’s door – but he told me to go away and I felt even more depressed and dejected that night. It later turned out, of course, that he’d brought a girl back to his room and was steadily making more intimate human conversation with her. So I might just have to avoid the cinema for the next couple of days! Originally uploaded by Mark McLaughlin. Picture the scene. You’re part of a guerilla marketing team dedicated to finding out new ways to promote a killer-virus movie. 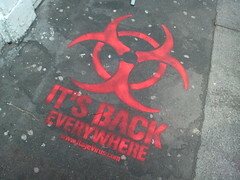 Thus, someone has the bright shiny idea of spraying biohazard signs all over London. Great idea, full marks. But how do you tie in the biohazard sign with the movie? Ahaaa, you say, you’ll stick a web address at the bottom of the biohazard sign. This will signify to one and all that it’s not a *real* biohazard – because heavens to Betsy, sticking a real biohazard sign in London would just cause panic amongst the populace. 1. Spraying isn’t exactly pollution or health-risk free, y’know. Plus, who’s going to clean it up? Why can’t I get a job on a web marketing team? Please? I know web and I know marketing! PS: Really looking forward to seeing this film! Although did it need a sequel?